"Deadly Weapon" is an object whose purpose is to cause death or that when used as an instrument of offense is capable of causing death or sometimes serious bodily harm. "Prohibited Weapon" is a weapon outlawed or regulated by this Act. "Knife" is a cutting instrument consisting of a sharp blade fastened to a handle. "Brass Knuckles" are a set of metal finger rings or guards attached to a transverse piece and worn over the front of the doubled fist for use as a weapon. "Collapsible Baton" is a steel club, separated in segmented sections, with the ability to collapse into itself for easy concealment and carrying in a holster (i.e. police officer's gun belt). "Nightstick" is a wooden baton or club, typically with a side-handle, primarily used as a less-lethal option for police in the past. Still in use by riot-police in the present day. "Los Santos Police Department Firearms Licensing Division (LSPD FLD)" is a division of the LSPD charged with issuing, enforcing, and regulating firearm and weapon licenses in the state of San Andreas. "License to Purchase a Firearm (PF)" is a license issued by the LSPD FLD that permits its owner to purchase and store a single weapon or more in their place of residence or business for the purpose of self defense, hunting, or sports. "License to Carry a Concealed Weapon (CCW)" is a license issued by the LSPD FLD that permits its owner to carry a concealed weapon on their person for self defense and defense of their personal property, in compliance with set rules and regulations. 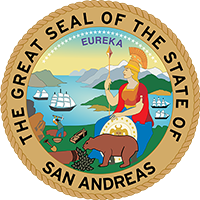 "San Andreas Guard Card (GC)" is a license issued by the LSPD FLD that permits its owner to perform security duties as an armed guard within the state of San Andreas. The role of a security guard includes loss prevention, store security, night club security, school security and a variety of other roles. Must own a PF License to obtain a GC. A civilian who possesses any prohibited weapon that is illegal in possession or not considered part of any legal weapon type. Will be subject to Officer Discretion as defined in the San Andreas Penal Code. Upon the passing of this bill, this act shall repel any other which infringes upon its stipulations. (9)01. 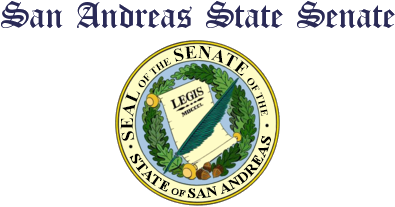 Possession Of An Illegal Blade shall be removed from the San Andreas Penal Code and replaced with guidelines created by Section 2. Illegitimate usage of Batons and Nightstick weaponry shall constitute a violation of (9)13. CCW / PF Violation.